While penguins are usually known for their fabulous sense of style, now it's your turn to get noticed! 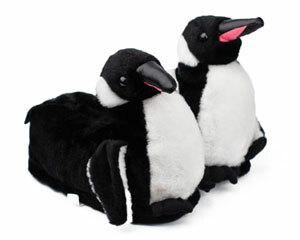 These plush and fuzzy penguin slippers aren't only adorable, they'll keep your feet warm in the iciest of temperatures. A durable sole and quality construction ensure they'll last for years. Just one look at his winning smile and twinkling eyes and you'll wonder why you waited so long! Keep cozy in high style. Penguins get tuxedos...you get penguins! Best gift ever! My girlfriend LOVES them, so good that I am buying a pair for my mom as well. Fantastic slippers. Very happy with everything. Those cute little critters keep us laughing and warm all nite. I highly recommend.